During the last 7 columns we’ve discussed general running guidelines to help you design a program to prepare you for the local, popular runs, the Portland Marathon and the Girlfriends Run for a Cure that will have thousands of runners and walkers participating from around the Northwest in the next few weeks. For today’s portion of running program, I wanted to focus on running technique. It seems easy enough, doesn’t it? Right leg, left leg, right leg….I remember asking a Canadian National Running Coach about the best way to improve my client’s running technique and his response was “the best way to improve someone’s running technique is to run!” And there is some truth to this for sure. The more you run, the fitter you become and the easier it is for your body to find the most efficient running forms. With that said, there actually is a science to running correctly to minimize injuries and maximize performance. Here are some tips to help you fine-tune your running technique. Keep in mind, don’t make any dramatic changes to your running stride too quickly which can lead to injury. Gradually adjust one thing at a time. 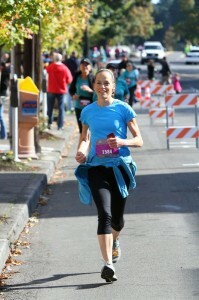 During the last 4 columns we’ve discussed general running guidelines to help you design a running program to prepare you for the local, popular runs, the Portland Marathon and the Girlfriends Run for a Cure that will have thousands of runners and walkers participating from around the Northwest this fall. During the last 3 columns we’ve discussed general running guidelines to help you design a running program to prepare you for the local, popular runs, the Portland Marathon and the Girlfriends Run for a Cure that will have thousands of runners and walkers participating from around the Northwest this fall. Last week, we reviewed an action plan in the event you are experiencing nagging aches and pains associated with running.